The photo included below was taken during my trip to the town Jekundo in Kham, Tibet in 2004. 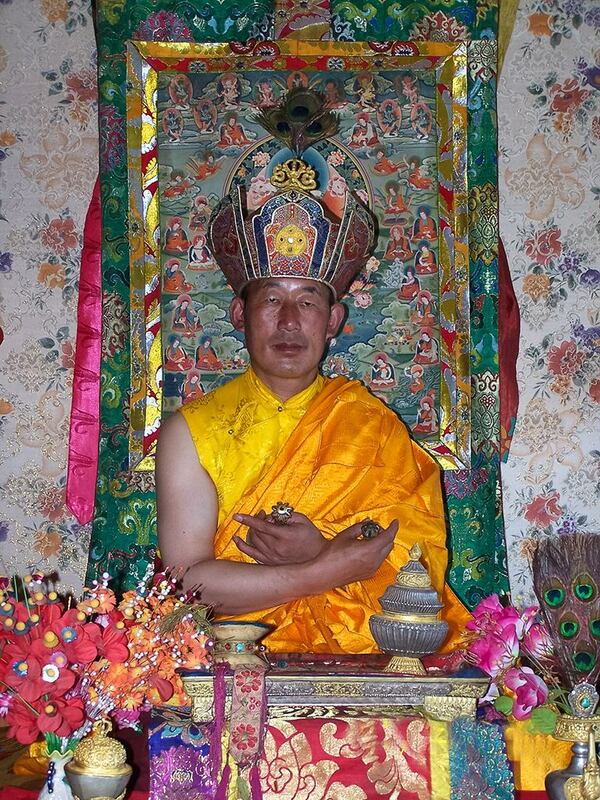 It is of one of the several reincarnations of the great tertön (treasure finder) Tsikey Chokgyur Lingpa Rinpoche. One of the more intriguing areas of Tibetan Buddhism (especially for me) is what is called "terma," which are precious dharma treasures that are hidden (and waiting to be found) in the earth and also right in the mind itself. These terma or mind treasures come to light and are found only when the world is ready to receive them. The Tibetans have so many areas of life where they have done something really elegant, while the same approach has never occurred to those of us here in the West, although we have the same opportunities. No one ever pointed it out to us. Terma is one of these that should interest us and I will attempt to explain why. There are four major lineages in Tibet and the Nyingma Lineage of Tibetan Buddhism is especially concerned with the concept of 'terma' (hidden treasure) and those who manage to find these treasures, called Tertöns. Generally speaking, there are two kinds of terma: earth-terma and mind-terma. Earth-terma are teachings that are hidden in physical locations like in a crystal, in or under a stone, at the bottom of a lake, in a statue, temple, or even in the sky, etc. On the other hand, mind-terma are just that, terma (treasures) hidden in the mind itself, the same mind that you and I have access to. All terma are, in essence, mind terma, something that has been inserted or placed within the mind itself, even if only as a pointer to an outside location. Perhaps the most well-known terma is the Bardo Thodol, the "Liberation by Hearing in the State of the Bardo," commonly called that "Tibetan Book of the Dead." How are these terma found? Terma can be stimulated by a sound, by a series of letters or numbers that appear in the mind, by a symbolic script, and so on. And they may come by way of a vision, which is an experience more vivid than ordinary life, one that once resonates, begins to work within the mind, sometimes for an extended time, much like a pregnancy, finally giving birth to the transmission of the terma itself. There is always a sign or stimulus. In other words, a terma is not so much something written down and hidden that is found, as it is a seminal spark or glimpse of a truth that blossoms (expands) in the mind of the tertön (finder) and is THEN written down. It is most often the tertön him or herself, fueled by this inspiration and insight, that becomes the author of what is considered the hidden document and treasured information. The tertön receives the transmission or insight from within the mind, grasps it completely and, as tradition indicates, then writes it out in a single session. Often two complete copies are written out in separate sessions and then compared. If the two copies are considered identical, then it is deemed an "authentic" terma. However, that is not the end of the process, but more like a beginning. The tertön or treasure finder has to first grasp the meaning of the transmission intellectually (manage to understand it), and then practice with it until the terma blossoms in their life as an actual experience. This often takes many years. It must be fully experienced. Even that is not enough. Finally, each terma must be realized, realized in its fullness, and only then may it be transmitted to the general public or to whomever it is destined to reach. All this is very interesting, of course. And it is interesting because it should strike a chord in us that sounds familiar. Dharma terma are not the only mind treasures out there. In truth, as mentioned earlier, there are ONLY mind treasures because all products and every invention known to humankind came from one and only one place, the mind itself. Think on that for a second. We are all tertöns; it is only a matter of to what degree and what kind or terma we respond to. This is what I meant when I stated that the Tibetans frequently come up with elegant uses of things common to us all, in this case the mind itself. I have been working with terma for over forty years, astrological terma. In fact, in 2004 I had the rare opportunity to go with my dharma teacher, the Ven. Khenpo Karthar Rinpoche, to China where we visited a sacred place called Mt. WuTai-Shan, five mountains arranged in the shape of a square, with one mountain at the center. It was at Mt. Wutai-Shan, so Rinpoche explained to us, that astrology first entered our world system by way of the bodhisattva Manjushri, who appeared there as a youth. From the top of his head, as the legend goes, poured forth the 84,000 astrological dharma or teachings, which were then given to humankind. Mankind got so infatuated with the astrology that they began to neglect the dharma. Rinpoche explained that astrology is one of the limbs of the yoga, but not the root. Dharma is the root. Astrology is what is called a relative truth, a way to get us from here to there around the surface of the sphere of life, a way to change or modify our approach or attitude, but it will never take us to the center. The dharma is the root of the yoga, the absolute way to the center. Manjushri, to protect humankind from the loss of dharma, removed the astrological teachings from our world, which made humans very sad. It was then that Guru Rinpoche (Padmasambhava), often called the "Second Buddha," intervened and pleaded for Manjushri to reinstate the astrological dharmas. Manjushri finally agreed to do this, but insisted on secreting them in the mind like timed-release capsules so that they could appear gradually over time, rather than all appear at once. They became astrological mind-termas, and are there to this very day. As mentioned, I traveled to Mt. Wutai Shan with my teacher and others, where we spent about a week. Offering prayers and pujas on the top of each of the five sacred mountains. That trip along with a trip to Tibet at the same time had a profound effect on me. When I returned home, all kinds of astrological treasures poured from my mind, which would be another story sometime. As pointed out, I had already been involved with finding astrological terma for many years before that trip, and I have been finding astrological terma ever since. It is not so difficult, just an unknown technique here in the West. How are these mind treasures originally inserted into the mind and why do we not simply stumble over them every day? "Inserted" here simply means formed or created, like a diamond is made, through great pressure and concentration. These insertions are symbols with power, and these kind of terma cannot be opened or found except by someone in a similar state of mind or for whom the doorway of the mind has opened at a certain time. In other words, they are self-secret. We already have termas here in the West, but just have never had them pointed out. For example, take the words of William Shakespeare. His works were inserted into the mind centuries ago, and are so powerful that they have defied the combined ears of centuries to hear the end of them, to unwrap and expose the extent of their depth. As we listen to Shakespeare, we are knocked into trance by their depth and never get beyond or behind the words themselves. The songs of Billie Holiday are another example, rich beyond hearing. In other words, they last or endure. Someday the works of Shakespeare will unravel, be fully exposed, releasing the bound energy so that perhaps that very spirit will again walk the earth. It has been many decades since I turned away from studying books on astrology and ventured into reading it in the mind itself. I have been advocating for many years that my fellow astrologers not just look in the old Greek, Roman languages, and astrological texts for truths, but to also turn inward and become astrological tertöns as well. It is so much easier, and the truths to be found there are evergreen. Astrological terma are always true and waiting to be found, understood, experienced, and realized. The point of writing this is to introduce the concept of mind terma not only as some exotic Tibetan practice, but as something we here in the West have every right to access as well. We may not be accessing dharma-terma, but we can find, as I have, astrological terma, or perhaps terma in whatever field of inquiry you happen to be interested.